The Kings’ Anze Kopitar has scored two goals in three games against the Devils, and both have been completely devastating. The first came in overtime to win Game 1, and while the second wasn’t a game-winner, it sure felt like one. 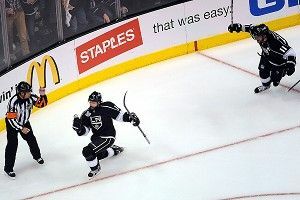 His tally in Monday night’s Game 3 put the Kings up 2-0, a particularly wide gulf in a series in which the Devils have managed to score just twice. Just as notable about both goals, though, is how beautifully they were set up by Justin Williams, L.A.’s 30-year-old forward who, somehow, remains relatively obscure despite playing on the team’s top line. The Kings’ top six guys include their captain, Dustin Brown, their marquee scorer, Kopitar, and a second line with plenty of name recognition: former Flyers Mike Richards and Jeff Carter, and of course our beloved Dustin Penner. And then there’s Williams, who was second on the team in scoring this season with 59 points; who has scored another 14 in 17 playoff games; and whose name you still don’t see too often on the backs of jerseys worn by the Kings fans inside Staples Center or loitering around the plaza at L.A. Live. Williams, who also put in his own rebound last night to push the game to 4-0, was traded to the Kings in 2009 from the Carolina Hurricanes. He arrived with a 2006 Stanley Cup ring but also a reputation for always being injured, having suffered ailments including but not limited to a torn Achilles, a bad back, a broken hand, and a torn ACL and MCL (twice). But he played in all 82 games this year, something he hadn’t done since the 2006-07 season, and has appeared in each of the Kings’ 17 playoff contests. With each game, he’s come closer to getting the recognition he deserves. Although, to hear him tell it after Game 3, it might not have anything to do with his play at all. “I think it’s because of the beards we’re getting noticed a little bit more,” he said, sporting a pretty magnificent one himself. Are the Sixers the Next Thunder?